I first saw Hundreds Hall when I was ten years old. It was the summer after the war, and the Ayreses still had most of htier money then, were still big people in the district. The event was an Empire Day fete: I stood with a line of other village children making a Boy Scout salute while Mrs Ayres and the Colonel went past us, handing out commemorative medals; afterwards we sat to tea with our parents at long tables on what I suppose was the south lawn. I loved this book, but it should definitely come with a warning. It is the first ghost book that left me sleeping with the light on. The book is set in the heart of the Warwichshire countryside in the first few years after the Second World War. Dr Faraday is called to the well known mansion called Hundreds Hall to visit a patient. He remembered visiting it as a child and is eager to visit it again. Hundreds Hall had belonged to the Ayres family for centuries and Dr Faraday begins to make regular visits to the house, befriending all the members of the family. The house used to be really grand and full of visitors, but it is now on declining rapidly and the family struggle to keep up with the financial struggle of the property. As time goes by, Dr Faraday realises that it isn't just the financial struggle of the house that is causing upset amongst the visitors; the house appears to be haunted by something rather sinister, intent on driving the family to madness. I usually find ghost stories quite easy to read and normally they don't scare me at all, however the ghostly goings on in Hundreds Hall are so subtle and yet terrifying, I found myself conscious of every little noise in the house. There are no ghostly apparitions, only noises and glimpses of things that pass, along with fatal accidents that cause the family to believe the house in haunted. These were scarier than if a real ghost had shown up within the pages of the book and said, 'BOO'. The house almost has a will of its own and at certain points within the book, you were convinced it was playing tricks with you. It comes alive within the story and has it's own personality. You wonder at times, whether the house is responsible for all the evil lurking about, as it is so unhappy about how it has been left to decline so badly. The Ayres family are rather pitiful and you cannot help but feel sorry for them, with all the bad events that happen to them; you almost feel glad that your surname isn't Ayres, because you definitely wouldn't want to inherit that property. The ghost knocks them down one by one like a game of ten pin bowling. Dr Faraday comes across as a rather respectable doctor who always turns up after the unusual events. I am aware that there has been a great discussion over whether or not Dr Faraday is actually responsible for the goings on in the hall and I can see why people believe he is. The ghostly goings on only begin after his friendship develops with the family; he is never around when they happen and they seem to ease off when he is due to marry Caroline, only to return after she cancels the wedding. Whether or not he knows he is causing these events is another matter. He has also yearned to revisit the house since his one visit as a child and he enjoys being associated with the family, so who is to know whether it was him or not. There is also a discussion as over Caroline's sexuality, with many believing her to be a lesbian. As there is no evidence within the book, I can only believe that everyone has this opinion because all of Water's other books have lesbians in. Waters also said this herself on The Book Show; it was discussed as ' Where's the Lesbian' within the book, similar to 'Where's Wally! The ending is ambiguous and I believe that has been done on purpose, to let you decide who is responsible for the hauntings and the deaths. The truth is never known. Everyone has a different opinion as to who was responsible for all the nasty things that happened. Personally I do think Dr Faraday was involved, but as Sarah Waters isn't going to let on, I will never know if I am right. I loved this book completely. I thought it was well written and felt that their were hidden stories with the story, which were left to your own interpretation. You must read it, but be warned, read it with the lights on! Thanks for the great review, Vivienne! This book sounds really good and spooky, perhaps a bit to much for someone who gets as easily scared as me LOL The one thing that puts me a bit off is the ambiguous ending, I like to have all the answers. Is this book first printed in 2009? The cover had me thinking it was an old book. Ladybug I don't mind the ending as it leaves you to your own conclusions. Yes, this was published last year and came close to winning the Booker Prize. The old style cover is on purpose and is very effective. This sounds fantastic! I really need to read something by Waters. I have a feeling once I do, I'll be reading her whole collection. Not one for me Vivienne, a vivid imagination at the best of times, it doesn't take a lot to have me scared. I keep reading fantastic reviews of this book, but you've got me wondering if I'm too big a chicken for it. 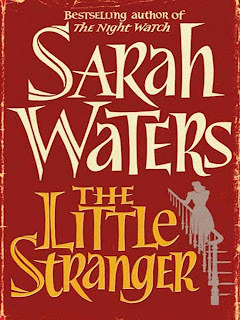 Amanda - This book has got me lining up my other Sarah Waters books in preparation. Petty Witter & Bermudaonion - would not advise it if you scare easily. Diane - you must read it. Carmen - what a lovely thing to say. I wonder if my love of books is actually contagious. I do think I have managed to get a lot of people I know actually reading more. I shall have to ask them. I can tell from your review that this would just scare me silly, so I'm going to have to pass. I just added one of her other books to my wish list though - The Fingersmith. Fantastic review! It sounds rather scary and totally engaging. I may need to add this to my TBR mountain. Wonderful review, Vivienne! I love a good ghost story and this one sounds like it really delivers. Well, it is a Waters book so that's what I would expect! Great review! I really need to read this. I keep putting it off but I don't know why. I certainly love a book that needs the lights on to be read. lol. Terrific review. I loved this book also. Yes, it was very creepy. Here is my review in case you missed it.